The Tanya is the largest of our square table sets. Our Tanya table features cast aluminium lattice work on the surface and a classic, curly pattern border design. This spacious 8-seater is similar in design to our Vanessa extension table, but the Tanya also provides space for fitting a revolving Lazy Susan to provide perfect sociable outdoor dining experience. Our revolving Lazy Susan inserts has become a must-have for most of our customers buying 6 seaters and above as it helps to pass food and condiments around the table by just rotating it around. The table weighs 46 kg and it comes with 8 chairs of your choice. 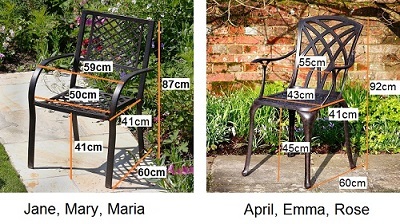 You can also choose a matching garden bench instead of a pair or to replace all or some of the chairs. To discuss all available options, please contact us before placing your order. 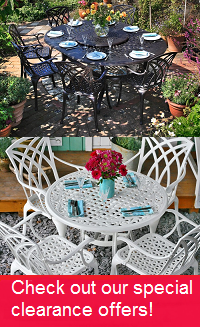 There is high demand for the Tanya table & 8 chair set in timeless Antique Bronze, but why not try our alternative colour, the Tanya in White, to help brighten things up in your garden. You could even save yourself a few pounds as we often have some great deals on these stunning alternative colours. Don't forget to look at our gifts section above where we offer amazing discounts of 30-70% on a wide range of products to complement your purchase of the Tanya table set. Excellent service. A good company to deal with! 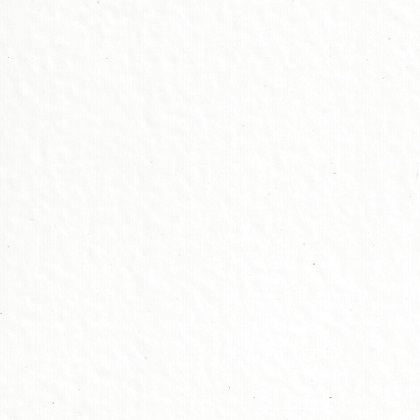 The product is robust and well made, cstomer service excellent, wrong item had been dispatched and without any quibbling. The correct was received in a few days, I would recommend lazy Susan, if you wish to purchase quality products. The cushions are just squares and are not shaped to the chairs. I was expecting something looking a little better from what is an expensive set.